Biosimilars are imitations of previously patented biologics, i. e. bioengineered pharmaceuticals. Unlike generics – copies of synthetic branded drugs with identical active ingredients – biosimilars differ from the original. They resemble it, but are not entirely identical. Nevertheless, a special approval process for biosimilars guarantees that these are just as effective and safe as the reference drugs. Biopharmaceuticals can only be similar to the original at best. This is because of their complexity and molecular size – as well as the production process – they can only be generated from living cells, such as microorganisms. 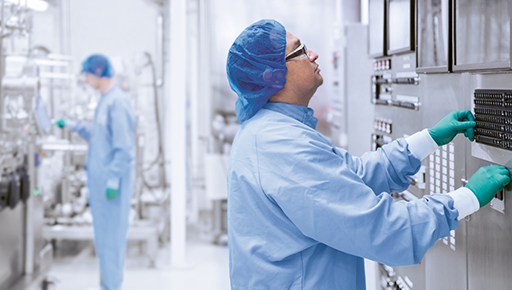 The production route plays a much greater role for biosimilars than for traditional generics. This starts with the type of genetically modified microbe, which is kept secret by the manufacturer of the original and can thus never be replicated exactly. In collaboration with a large Asian corporation, WACKER already produces, on behalf of a customer, a biosimilar that is used to treat age-related macular degeneration, which affects the retina of the eye. This is an up-and-coming field with huge growth potential, as numerous patents on biologics – which are usually quite expensive – are due to expire in the coming years. That opens up the market and competition for biosimilars, which are generally less expensive than the originals and thus more affordable for healthcare systems and patients. However, this requires a good, efficient biotech process. That is precisely what the WACKER processes offer. 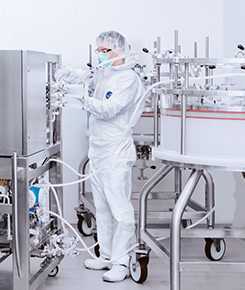 They provide fast production of high-quality biologics – together with the advantage of low costs. From gene to active ingredient in four weeks – this is possible with ESETEC®, the expression and secretion system developed and patented by WACKER. The biotech platform is based on the Escherichia coli K12 bacterial strain and a series of plasmids – small, circular genetic fragments. 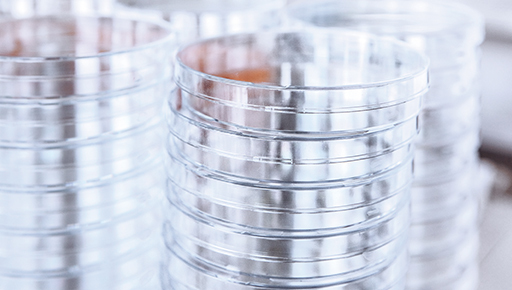 It is one of WACKER’s ongoing tasks to further enhance this innovative high-performance production system for biologics and to equip it for the manufacture of new protein and active-ingredient classes with useful abilities. A glimpse into the bacterial cell makes the approach clear: genetic engineering methods are used to modify the metabolism of the microorganisms, for example, so that they expel the active they produce from their cell at a specific time or in response to a stimulus. This makes harvesting the biopharmaceutical easy and efficient. Another goal is to deactivate specific proteases to increase production. The background: the bacteria’s enzymes break down some of the desired proteins into their amino acid building blocks again and thus decimate the yield. Work is ongoing to prevent this. These and other improvements make the ESETEC® production system even more effective, versatile and robust. Petri dishes for cultivating microorganisms. 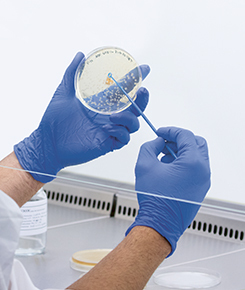 Bacteria such as E. coli form the starting point for producing biologics. Chromatography at the Jena site. Fermentation at the Amsterdam site. We are never truly alone, because there are some 38 trillion bacteria living on and in our bodies. That actually makes human cells, of which there are only around 30 trillion, the minority. This bacterial zoo – or microbiome, as experts call it – has a huge impact on our health. The microbiome consists of both beneficial bacteria and pathogenic organisms. For a person to stay healthy, the two must be balanced. That’s why scientists are looking for a new generation of probiotics – or helpful microbes – that have a positive effect on the immune system and, as pharmaceutically active substances, even have the potential to heal. The corresponding projects are being performed at the new WACKER site in Amsterdam: the BIOSOLUTIONS experts here are working on, for example, beneficial bacteria for premature babies. The “good” microbes can remove “bad” ones that are responsible for life-threatening necrosis, for example, and help the babies make a healthy start into life. Other specially designed bacteria can produce growth factors that promote wound healing and can thus prevent amputations for diabetics. These kinds of bacteria belong to the so-called probiotics. WACKER intends to pursue this medical trend further in the future and win customer projects. At WACKER, the most important resources for innovations are the ideas in the employees’ heads. 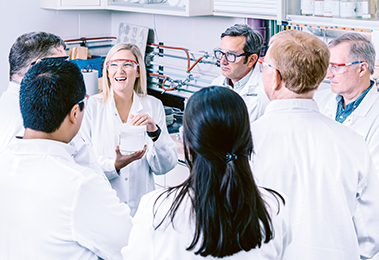 Dr. Oliver Minge and his eleven-strong team ensure that the right ideas are identified and developed in the WACKER BIOSOLUTIONS division – so that they can give rise to new innovations. As part of an innovation management system, ideas must first survive a strict selection process. Only 10 percent manage to pass this first hurdle. The candidates then undergo a multistage innovation process that can last anywhere between six months and five years. Milestones are defined and must be achieved within specified time frames and budgets. The process ideally culminates in the scale-up and market launch of a new or refined product. In coordination with its corporate sectors, WACKER produces tomorrow’s products and applications. “We are not the only ones looking after innovations at BIOSOLUTIONS, however,” says Minge, who has been in charge of the innovations team for the past one and a half years. 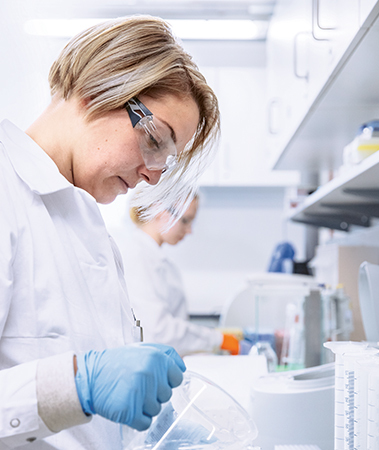 Chemists, biologists, biochemists, process engineers, food technologists, laboratory assistants and chemical-technical assistants in the regions and individual departments are also driving new developments. “They are close to the customer, are familiar with specific regional requirements and get support from us,” explains Minge. So, there are some 30 innovation drivers overall. Together with the affected corporate sectors, they decide which ideas make it to the innovation process. “When we receive an idea, we develop it up to a certain point – then we decide whether it has the ‘WACKER fit,’” says Minge. He means whether the idea fits in with WACKER’s technologies, raw materials, markets and sales channels. It must also be clarified whether the cost-benefit ratio is good, whether existing patents could potentially block development and whether the time is ripe for a product. There are currently some 30 projects up and running, with three quarters of them being promoted together with partners – whether research institutes, universities, startups or customers. The focus is on biologics and food. That was a strategic decision. “We also make sure that we have a good mix of many smaller projects that are close to WACKER’s business and a few disruptive projects aimed at opening up new fields,” says Minge. If an idea is rejected or if it fails the innovation process, it does not go straight to the recycle bin, but into the ideas archive set up by Minge. Some 50 ideas are currently sitting there, waiting to maybe be taken out of the drawer again sometime – when the time is ripe.